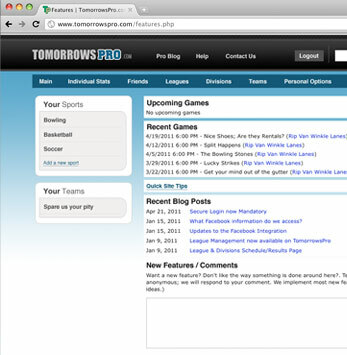 Perfect web site for anyone trying to organize their sports life! Tracking your sports stats has never been easier! TomorrowsPro.com is your only option for storing your personal statistics on the web. Currently we support storing your Baseball, Basketball, Bowling, Cricket, Football, Hockey, Kickball, Lacrosse, Soccer, Softball, and Volleyball stats. With internet technology growing everyday you should have more options with your stats than writing them down on paper. Did we mention that this service is entirely FREE? Our sports software works with any one or all of the sports below. First you just need to sign up for the package that works best for you. Set up only takes a minute. This package is FREE and comes with all the features you'll need. Included in this package are stats, schedule, stats printing, stats filtering, stats graphing, stats sharing and more! This package is FREE and comes with all the features you'll need for your team. Included in this package are schedules, rosters, stats, graphing, printable lineup cards, game reminders, and more! This package is FREE and comes with everything you'll need for your league. Included in this package are full schedule/results, league leaders, division stats, division standings and more! Not sure which package is right for you? Check out our comparison page.